Good morning, my little peach! 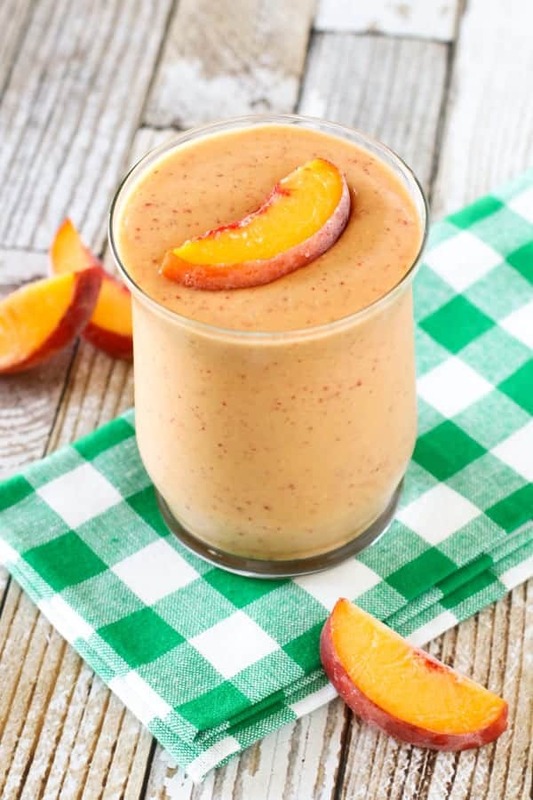 This dairy free Peach Cobbler Smoothie is a splendid breakfast treat. Creamy, peachy, and with that perfect touch of cinnamon. YUM! I like to keep my smoothies simple. Five ingredients or less is good with me. I start with some frozen fruit, usually 2 different kinds. Then, I’ll add a scoop of protein powder. I’m in the mood for something green, I’ll grab a handful of fresh spinach or kale. For liquids, I always use unsweetened coconut milk or almond milk. Hemp hearts or nut butter are a great way to incorporate a little added protein. I’ll finish this off with a drizzle of maple syrup or sprinkle of coconut sugar. It doesn’t take many ingredients to make a yummy smoothie. The summer fruits are still in abundance here, so I recently stocked up on fresh peaches. I sliced them (with the peels still on) and froze them in an even layer on a baking sheet. Once frozen, I placed them in a ziploc bag. Now, I have them for smoothies or peach pie. What’s your favorite summer smoothie flavor? 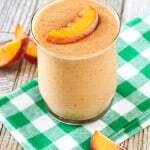 Be sure to let me know if you give this Peach Cobbler Smoothie a try! Recipe and article courtesy of Sarah Bakes Gluten-Free. To a high powered blender, add frozen peaches, almond milk, oats, coconut sugar, cinnamon and vanilla. Blend on high 1-2 minutes, until oats are finely ground and smoothie is creamy. Pour into serving glasses. Enjoy! This entry was posted in Beverages, Dairy Free, Recipes, Vegan and tagged dairy free smoothie, G-Free Foodie, gluten free, gluten free dairy free, gluten free smoothie, peach cobbler smoothie, peach smoothie, Sarah Bakes Gluten Free. Bookmark the permalink.